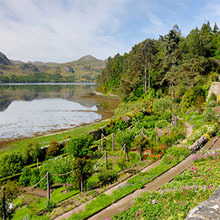 A lush, tropical oasis perched on a peninsula at the edge of Loch Ewe amid the rugged landscape of Wester Ross, this world famous historic garden is one of Scotland's most popular botanical attractions. It is surrounded by over 2,000 acres of estate managed for conservation. Widely regarded as one of the most beautiful gardens in Scotland, Inverewe is a must for anyone who loves nature. 1 Nov to 31 March - Daily 10.00 - 3.00.